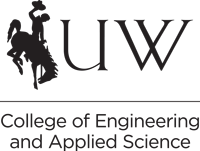 UW’s School of Energy Resources has partnered with the College of Engineering and Applied Science for facilities and investments to enhance education and research in the following areas. The School of Energy Resources includes many elements of the following research centers of excellence (COE) in its strategic initiatives. 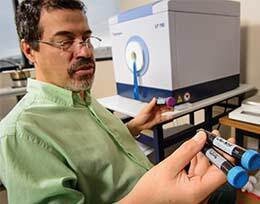 Department of Chemical and Petroleum Engineering Professor Vladimir Alvarado’s center of excellence will focus on improved oil and gas recovery in unconventional reservoirs. A generous donation from ExxonMobil funded an advanced core-flooding dynamic geochemical flow-thru system and a state-of- the-art microfluidic experimental platform. The team has also received U.S. Department of Energy funding. 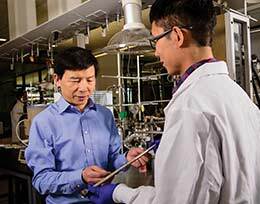 This innovative coal-conversion project led by Department of Chemical and Petroleum Engineering Professor Maohong Fan aims to produce a synthetic gas that can be used in the production of value-added chemicals. Donations from Peabody Energy Inc. and Arch Coal Inc. were matched by the state to support this promising research. Wyoming is the most prolific coal-producing state in the United States, but in 2013, Wyoming coal production fell by 3 percent, making Fan’s research all the more timely. 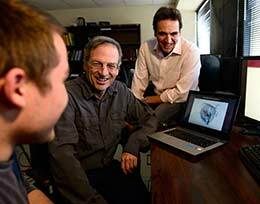 Led by Department of Mechanical Engineering Professor Dimitri Mavriplis, this work continues developing world-class computational research infrastructure. The state has made major investments both on campus and in attracting the NCAR-Wyoming Supercomputing Center to the state. In addition, management of big data and the development and use of sophisticated high-fidelity computer-based simulation models are becoming increasingly important across a wide range of industries, such as the energy industry and advanced manufacturing. About 50 to 70 percent of the original oil remains stranded in Wyoming’s aging fields, and enhanced oil recovery methods have the potential to retrieve an additional 5 to 15 percent. Wyoming Excellence Chair in Petroleum Engineering Mohammad Piri, an international leader in the field, will lead his team as they examine oil and gas flow in unconventional reservoirs. 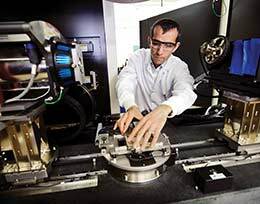 Their research includes a permeability simulator model to improve oil and gas reservoir rock yield forecasts, improved reservoir characterization methods, a fundamental pore-scale model for establishing oil and gas flow in reservoir rock, and screening of new surfactants and nano-fluids to stimulate oil and gas productivity.